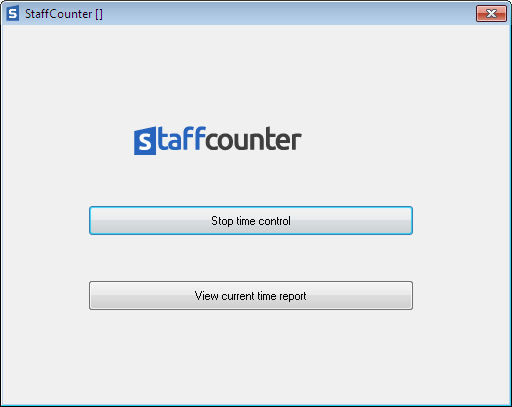 StaffCounter Agent is a tool for monitoring a user’s actions at a computer, designed especially for the StaffCounter time-tracking service. It helps overseeing employees and how they work at the computer. Managers can view an analysis of this data at the StaffCounter website at any time. The program requires a constant internet connection. Thanks to our analytics service, even the busiest managers can check on what their employees are up to at their computers in just a couple of minutes. The agent logs all user activity on the computer and requires only a couple of minutes to set up. It runs in the background and doesn’t put a heavy load on the system. it can be temporarily disabled, so that workers can use the computer for their own personal needs. 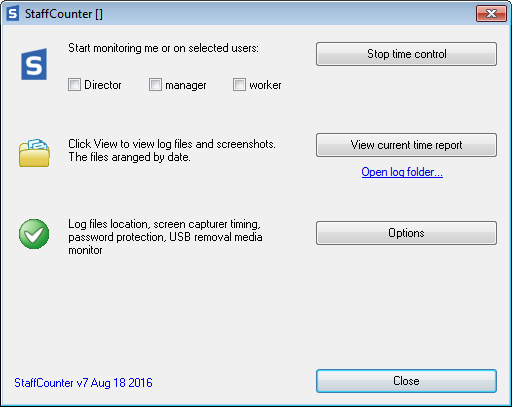 Download StaffCounter Agent on the computer your employee will use. You will need to unpack the .zip archive. Unzip it into a new folder. Attention! For Windows 7 users make sure you have installed the following security update: Microsoft Security Advisory. 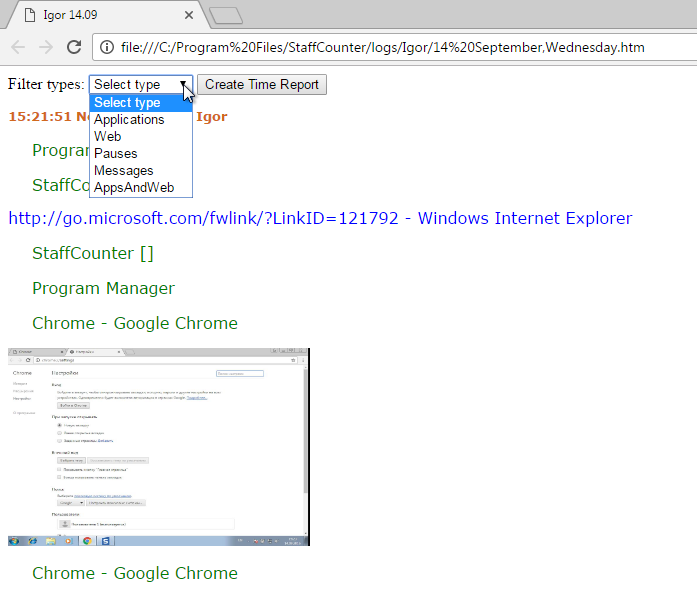 Immediately after installing the program, enter the e-mail address associated with your StaffCounter address into the main window. Below that, enter the name of the employee or the name of the device. 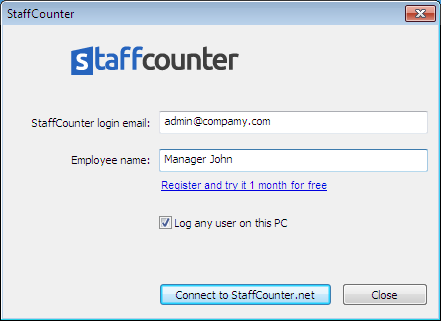 Right after the program has been installed, enter the e-mail account for your StaffCounter account in the main window. Below this, type the name of the employee or the name of the device. If you need to track the actions of all users, tick the box next to the respective option. Otherwise, only the current user will be tracked. After the program connects to the server, monitoring will start automatically. The program will take settings from the server each time the user logs on to the system. 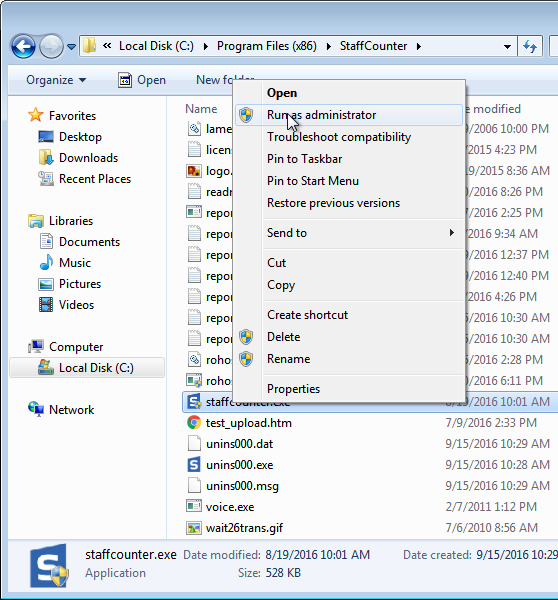 To adjust program settings on the computer itself, open the Program Files/StaffСounter folder and launch the agent as the administrator. In the main application window you will see which users the program is monitoring on the server, as well as several control buttons. Click Options to enter the expanded settings. In the first tab you can specify which user actions you are mainly interested in, and you can also set a password to protect the application’s control panel. Without knowing this password, it will be impossible for anyone to change the settings. In the second tab, Staffcounter.net, you can change the device ID or switch the application to a different profile on the server. To do the latter, you should enter the e-mail address of the different profile in the Staffcounter.net login field. In this way you can, for example, move an employee from one virtual department to another. In the third tab you can adjust settings for recording sounds around the computer. Use the slider to adjust the microphone’s sensitivity. 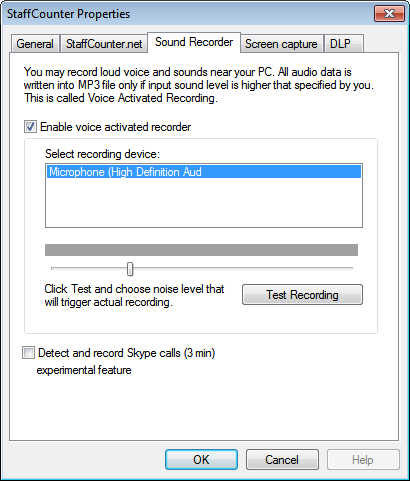 Be sure to specify the recording device and test recording first. The fourth tab is for screenshot settings. 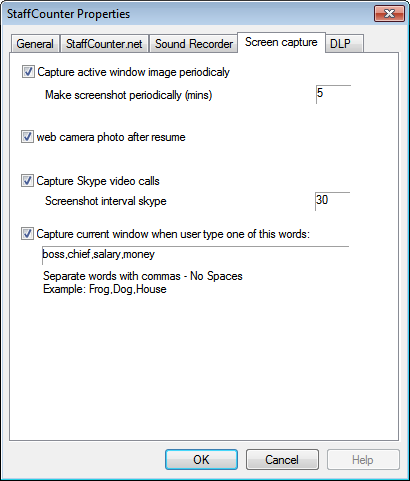 The latest version of the application can take a picture of the screen at different time intervals, during Skype conversations, or whenever the user types certain words. In the final tab you can set special options to protect against data leaks. After opening the configuration file, you can set up protection by reading the comments and leaving the value 1 after the options you need. Remember that by default, only the user that activated this protection can make changes to it in the future, and before removing the application you should disable this protection. Can an employee turn StaffCounter off for some time? An employee can click on the StaffСounter Agent application icon in the system tray and stop monitoring. It is also possible to start monitoring again from this window. To check his or her own record, an employee can open here a local report for the current day. Prevent downloading and running applications from the Internet and external devices. After the registration on our server and StaffСounter agent installing open Settings page and scroll down to the DLP section. It is necessary to switch “Disable sending files by Bluetooth” on. Now data transfer to Bluetooth devices and back will be impossible. Turn on the option Control USB flash drives and HDD by serial number. In the next field we create access rules for USB drives based on their serial number, VID and PID. To find out the serial number, VID and PID of the drive, install the ChipGenius program. Having received information about the serial number, VID and PID, we can prohibit the recording of information on our USB flash drive or on removable disk. the “*” sign in this case means any VID and PID; This can be done to save time, since the serial number is quite unique, and the VID and PID are often the same. A void after = means that no actions for this drive on this computer are applicable — neither reading, nor writing, nor formatting. Attention: with the “r” parameter, it is impossible to record new data, abut deleting old data and formatting is possible, so be careful! The command concerning all other drives should go last in the list. *:*:*= // means for all other devices everything is forbidden. *:*:*=r // means for all others is allowed only reading. *:*:*=rw // means for all others – without restrictions. Turn on the checkbox Block access to smartphones and cameras connected by USB. The function does not allow users to transfer data to phones, cameras, players, and other devices connected via the USB port. Devices are not available for reading and writing. Turn on the Disable write files to DVD recorder option. The program prohibits writing to CD and DVD directly from the conductor, as well as through various burning programs. Turn on the item Disable uploading data with following browsers:. In the Rules field, you can enter one of three (or several immediately separated by a semicolon without spaces) supported by our system browsers: Google Chrome (chrome), Internet Explorer / Edge (iexplore), Mozilla Firefox (firefox). Sending to external resources through selected browsers will be prohibited. Check the Block access to all shared folders option. Now the recording of files and folders in the local network folders (including FTP) will be prohibited. File reading is still available. Turn on the Disable to download applications from the web option. This module will prohibit downloading applications from the Internet, unzipping executable files, as well as installing new programs. In addition, unauthorized removal of the StaffCounter DLP agent from the operating system will be prohibited. If you need to uninstall our product, you will need to disable this option first. only the user who has access to the Control Panel on the StaffCounter can disable the protection functions and make changes by default. Other users (even with administrator rights) do not have the authority to change the module configuration. 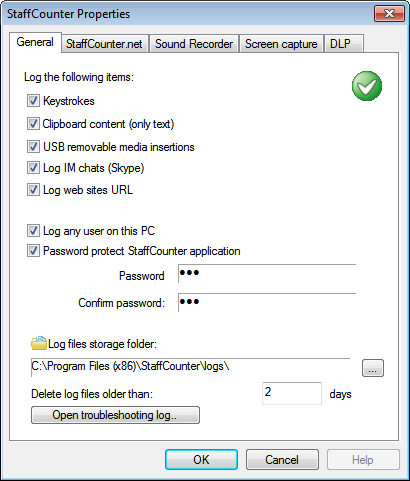 Before uninstalling the program of StaffCounter, you should disable DLP protection, otherwise the removal of the program will be refused. Before installing on Windows 7 and Windows 2008, you should install the latest security updates from Microsoft Security Advisory. After the swhitching option on and off, you should save the settings and restart target computer. 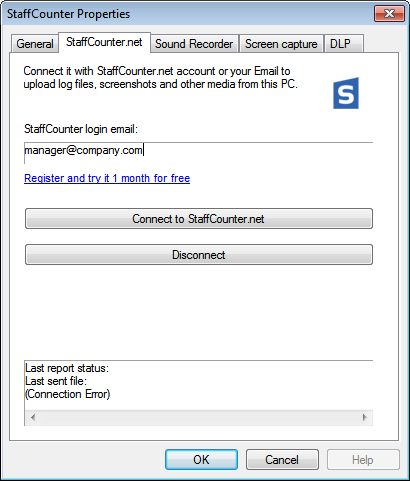 If you have configured Data Leak Prevention, Login your user account on data.staffcounter.net. On Settings page choose the department that target computer belongs to. Uncheck all the options in DLP settings. Save the configuration. 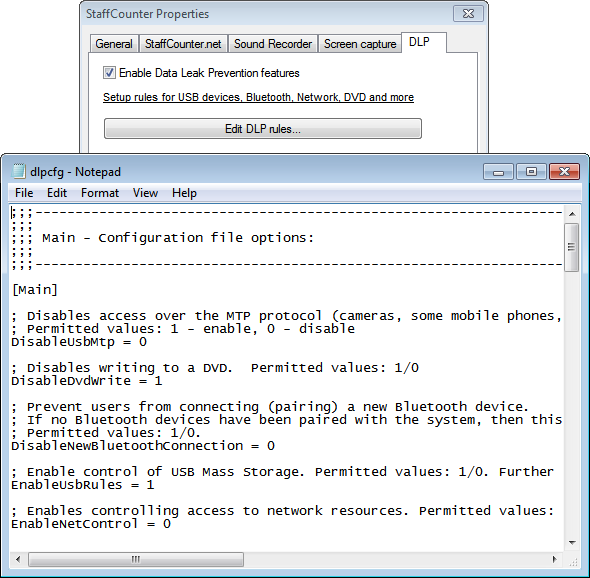 StaffCounter Safe agent – reduced version of monitoring agent for Windows, with open-source code. It records the time of session starting and pauses. User interface of the application is the same as StaffCounter agent. This application is recommended, if using of the computers for personal purposes is allowed. Open source code provides you to be sure, the application has not any backdoors.